We all have difficult people in our lives. It’s a real skill to be able to manage our own emotions in the face of aggressive or spiteful behaviour and to know how to respond rationally and constructively. Eleanor Shakiba is an expert in dealing with difficult people. 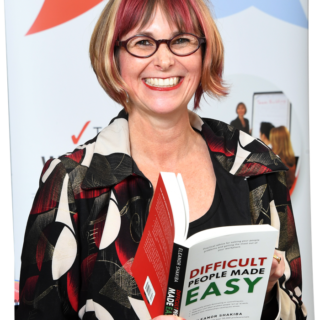 In her book, Difficult People Made Easy, Eleanor helps us to understand the different modes and patterns of toxic behaviour. She outlines a suggested response to each of them – and as luck would have it, she joined me on the podcast to tell us all about it. If you have difficult people in your life and you are often stuck for how to respond, this is the episode for you. A difficult person breaks the unspoken rules of socially-acceptable communication. These are called boundary violations. Fight – aggressive, shouting, interrupting, talking over others, slamming doors, throwing things. ‘Getting in someone’s space and intruding on them in a way that is not acceptable’. Flight – Someone who runs away from conflict – it allows problems to fester and grow. They come across as very passive, their contribution to the team diminishes. This behaviour is avoiding the need to have tough conversations. Spite – An attitude of cutting your nose of despite your face. If I can’t have what I want I’m going to make the environment uncomfortable for others even if that makes me miserable too. Revenge. Sabotage, back-stabbing, gossiping, go slow. Passive aggression. Where Does Spite Come From? Usually those who demonstrate spiteful behaviour feel a lack of personal power. They feel angry or frustrated and they want to speak up but they don’t know how to do that effectively. ‘I have such low self esteem that I’m willing to damage myself in order to get back at you’. Despite how some may present, we very rarely see someone who is actually angry. Anger is a strong emotion but usually is a translated emotion. Angry is easy because it allows one to stop taking responsibility. It more than likely represents more complex emotions like shame, pain, fear or embarrassment. There are six Toxic Verbal Patterns commonly involved in boundary violations. And six verbal ‘antidotes’ for these. Each of the three modes of difficult behaviour – fight, flight or spite – exhibit these toxic patterns, but they do them in different ways. While it’s tempting to play amateur psychologist, to try and work out why someone is ‘difficult’ it’s not all that helpful. What is really important when we seek to handle difficult people better is to manage ourselves. The key is managing what you do in response to difficult behaviour. How do you stay calm, to be proactive and remember to implement the responses to difficult behaviour as outlined above and in the conversation with Eleanor. Your goals should be to de-escalate the situation and to not let that person upset you.